Long before anyone seriously* thought to connect Holmes with the crime, one name tossed about now and then was Dr. Thomas Neil Cream, who is reputed to have said “I am Jack the…” on the gallows, with the trap springing before he could finish the sentence. A known serial killer, Cream had operated for a time in Chicago a few years before HH Holmes came to town. Born in Scotland in 1850, Cream studied medicine in London and Edinburgh before moving to Canada and then Chicago, where he opened a clinic on Madison Street, near Throop (the sight of a parking lot now). This was a terrible red light district at the time, and it’s generally believed that Cream’s stock in trade was providing illegal abortions to prostitutes. He had been caught trying to perform an abortion on a girlfriend back in the UK, and was quite literally forced to the church at gunpoint (though his wife died, allegedly of tuberculosis, shortly thereafter). In Chicago, a witness who ran a boarding house at 1056 Madison (about Madison and Western today) said that Cream claimed in 1880 to have treated about 500 girls in Canada, and at least 15 in Chicago. When one of the patients, Mary Anne Faulkner, died in the boarding house in 1880, apparently of poisoning, he was brought to trial, where he insisted that it was all the nurse’s fault (the nurse, Hattie Mack, ran the boarding house). Mrs. Mack testified that Cream had offered her $30 to let him pour tar over the body and burn the house down, but she refused. He was eventually let go for lack of evidence. The next year, an elderly man named Daniel Stott who suffered epilepsy and had just married a much younger woman. She came to Chicago from their home in Garden Prairie, and met with Dr. Cream about getting treatment for his epilepsy. 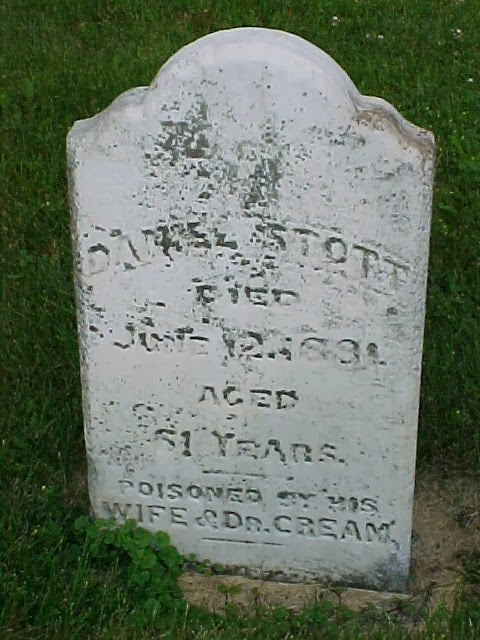 Cream gave him such treatment, but, upon finding out that Stott’s wife stood to get a lot of inheritance and insurance when the old man died, he apparently began an affair with her (or made plans to, at least), then arranged for her to give the man medicine that included a small amount of strychnine (to which he then apparently added much more strychnine). It was a perfect crime – if an autopsy found strychnine, he could show the drug store records saying there was some of it in the medicine, though not enough to kill a person, and the case would be closed (or at least blamed on the pharmacist, not him). The widow would cash in, and he’d swoop in and sweep her off her feet. They could even make more money by suing the pharmacy. But no one thought there was anything suspicious in the death at all, so there was no talk of suing the pharmacy and no reason to blackmail them. Cream sent a telegram to the coroner stating that he didn’t believe the cause of death was truly natural, and when that telegram was ignored, he sent so many more messages and letters demanding an autopsy, then finally went to the police. After running some tests on the medicine, they exhumed the body and found enough strychnine to kill six men, and 30x more than the prescription had called for. This was no pharmacists error – obviously, there was foul play involved. Cream had as good as turned himself in. Police (and Mrs. Stott) quickly deduced what had happened. Mrs. Stott was arrested as well, and Dr. Cream fled. He was arrested in Canada, brought back to stand trial, and wound up spending nine years in prison from 1883-1891 (which, incidentally, pretty well clears him of suspicion of murdering anyone in London in 1888). 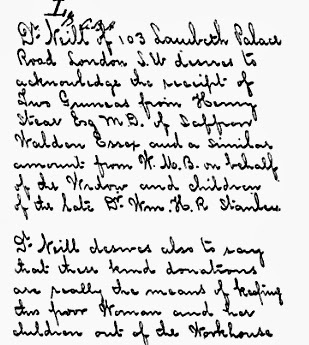 Upon his release, he returned to London, where he seems to have embarked on a regular spree of giving poison drinks to prostitutes; he was eventually arrested for one of the murders and hanged in 1892. 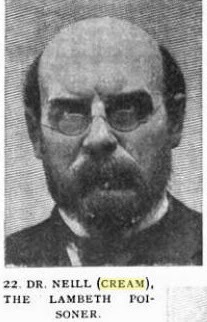 During his trial, he swore he was “Thomas Neil,” not the “Thomas Neil Cream” who had been convicted of poisoning before, which Ripper conspiracy theorists often site. Just how many people he killed, and why, will never really be known; the above accounts were pieced together from contemporary Tribune articles, but I’m note sure anyone’s ever done a REALLY in-depth investigation on the guy; most books on him come from a handful of bad sources, and, like most serial killers, tabloid and pulp versions have strongly influenced what we THINK we know. His claim of being Jack the Ripper on the scaffold is generally ignored (contemporary witnesses didn’t mention it), but I did run across a news item published during his trial saying that it had been firmly established that Cream and the Ripper were one and the same. Some theories go about that Dr. Cream and Dr. Neil really weren’t the same person, just as was claimed on the stand. The photograph of Dr. Neill above DOES look markedly different from the more common photo. I feel like there’s a lot more to find out about this guy; most books and articles have the same bad info, the same wild guesswork, and the same one photo of him in a top hat. * – the connection between Holmes and Jack the Ripper was at least mentioned by Chicago police as early as 1895, though in a joking way. When Holmes was suggested as the killer in an unsolved murder from the suburbs, the chief laughed and said “you might as well connect him with the Jack the Ripper horrors.” See our murder castle ebook (expanded edition) for more. Pardon our Dust – the new Mysterious Chicago blog!